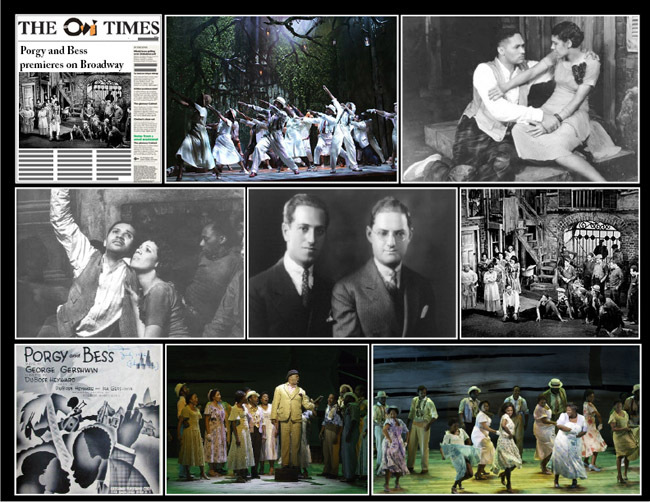 On October 10, 1935, George Gershwin's opera Porgy and Bess premieres on Broadway. Porgy and Bess began its journey to the Broadway stage in 1936, when George Gershwin wrote a letter late one night to the author of a book he was reading proposing that the two of them collaborate on an operatic adaptation. The African-American poet DuBose Heyward, author of the novel Porgy, immediately agreed to Gershwin's proposal, but commercial commitments in New York prevented Gershwin from actually beginning work on the project for another seven years. In the meantime, singer Al Jolson attempted to mount a musical version of Porgy starring himself in blackface, but that effort foundered in 1932, leaving the way open for the Gershwin-Heyward collaboration that would feature an all-African American cast of classically trained singers—revolutionary casting in 1930s America. Over the course of more than two years beginning in the spring of 1933, DuBose Heyward and the two Gershwins—George's brother, Ira, joined on as co-lyricist in 1934—collaborated mostly by U.S. Mail, with only occasional face-to-face meetings. In this fashion, they nevertheless managed to create some of the greatest songs in American musical-theatre history, including "Summertime," "I Got Plenty O' Nuttin'," "It Ain't Necessarily So" and "Bess, You Is My Woman Now."